Eric Hunter is a legal knowledge management colleague and recipient of ILTA’s 2010 Knowledge Management Champion Distinguished Peer and Innovative Member awards. He is Director of Knowledge, Innovation and Technology Strategies at Bradford & Barthel, LLP (a California law firm focused on worker’s compensation) and also Executive Director of the Spherical Models consultancy. His wide-ranging report (available at Amazon, Ark Publishing or Amazon Kindle) puts business analytics and the insights it offers at the core of wide-ranging potential changes in legal and other industries. Though future-oriented, it spends most of its time on developments whose beginnings are firmly entrenched, such as video search, wearable tech, big data, and data visualization. Through my own work I have come to believe that legal organizationss – and perhaps organizations in general – can obtain significant competitive advantage by leveraging analytics and technologies and taking better advantage of our increasing connectivity and ability to share inside and outside the organization. Hunter’s report provides more substantiation for those beliefs, and also projects ahead to suggest how to prepare for the increasingly rapid changes that are coming. I appreciate that Hunter is “walking the walk,” talking about increased sharing while doing so himself through this book and his many presentations at Ark and ILTA conferences (referenced throughout the report). 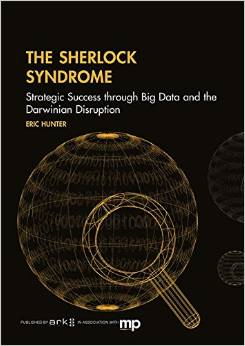 The title’s “Sherlock Syndrome” concerns our increasing ability to observe, sense, cross-reference, and analyze information and trends much more comprehensively than before through data analytics and Big Data. The trend is one of massive increases in the ability to recall, analyze, and leverage information. Hunter posits that, at least with respect to personal preferences and search patterns, “everything is becoming predictable (and therefore marketable) through analytics.” Particularly striking to me is the thought that not only are the abundance of data and power of our computers increasing rapidly, but also the sophistication and availability of easy to use analytics tools are making this information actionable in ways that were never before possible. I have seen this myself in my firm’s exploration of the Tableau data visualization tool. Business use-cases for Sherlockian advanced perceptions include forensic (criminal) investigations, insurance claim investigations, and, of course, targeted consumer advertising. Hunter also believes that “Darwinian data disruption” is affecting the entire business world. It is not simply data—though the scope of data is increasing dramatically every year—but also computational and analytical capacity that is growing so dramatically. Hunter’s disruption is Darwinian because leveraging these changes provides a clear competitive advantage and those organizations and business leaders able to adapt to the new environment will survive. Businesses that cannot adapt to and take advantage of these technologies and changes may not survive. It may have been said many times before, but it is true: as Hunter observes with many examples, we are seeing accelerating levels of market disruptions as companies learn to innovate faster. Hunter spends a good deal of time digging into the “Snowden” effect (not David Snowden the KM guru, but Edward Snowden, the former NSA contractor). In Hunter’s view, Snowden’s revelations of widespread government capture of vast amounts of personal information in pursuit of national security encapsulate the inevitable tension among privacy, the right to share, and the (security and other) benefits of access to others’ information. Snowden demonstrated that cross-border information sharing is happening and will happen more and more. The NSA, US government agencies, and other governments that capture and share personal information are in his view just taking to an extreme and for different ends what corporations like Facebook and Google already do to target advertising to consumers. Hunter does not neglect the implications of these much broader developments for the legal industry. Within law firms, Sherlockian advanced perceptions aid pricing, methods for doing legal work, internal communications, and understanding and addressing client needs. The new technology, analytics, and cross-border flow of information have the potential to greatly enhance law firms’ understanding of their clients and clients’ understanding of legal issues. The technologies increase the capacity for clients and firms to build “targeted relationships” and provide a continually expanding set of opportunities. And, the same data collection and predictive analytics that Facebook and Bing use to identify our consumer interests also identify our business needs. Analytics technologies can be applied directly to some types of legal issues, such as the likely extent of exposure from a given worker’s compensation claim. Another example is law firms’ new ability to bring transparency to matter work, including data analytics around pricing and profitability, staffing models, and project models. Hunter spells out how the concept of “velocity billing” combines client-specific account managers, predictive analytics driving client- and firm-appropriate fee arrangements, and social collaboration around matter and client work has affected his firm. In combination, these processes and technologies lead to very efficient and client-targeted legal work. Another instance of these technologies manifesting in law firms is his own firm’s adoption of Google Plus (“G+”). While much-maligned as the place where only Google employees “hang out,” Hunter sees G+ as a great example of a system that is both inward- and outward-facing and combines search with a designed social platform. Creating a G+ circle is the kind of fluid, effective, searcheable content and process management Hunter sees in the future of legal work. For Hunter’s firm, G+ is both an internal- and partially external-facing social network and platform. He notes that social network implementation and internal change management, like the pricing and client management projects he has had so much success with, involve different change management dynamics needing different approaches. For law firms and the general corporate world, the technologies, techniques, analyses, and insights gained and shared so rapidly can be applied to not just readily quantifiable attributes of work such as hours, effort, and outcomes, but also leadership and change management at the levels of self, team, and organization as a whole. Hunter’s exhortations on leadership are very similar to what you might hear from many an Eastern-philosophy or martial arts- influenced business leadership book; what differs is the tie-in to his Sherlock/Darwin analysis. Hunter suggests that people, teams, and organizations should be reinventing themselves through these enhanced perceptions and abilities every 18 months. Much of the report is fairly abstract; I would not go to this book for an introduction to business analytics or Big Data. Nor was it entirely easy to read, with a fair amount of repetition and some extraneous quotes from Ghandi, Leonardo Da Vinci, and Hunter’s martial arts instructor. Finally, the size of the book’s print is too small (at no more than 10-point font) and somewhat faint. Perhaps the book is easier to read on-line (admittedly an appropriate production strategy given the book’s topic). Overall, I found Hunter’s report an intriguing and inspiring application of broad industry, technology, analytics, and behavior trends to the ground level of the key interactions between law firms, legal work, and clients. His predictions about predictive analytics and more are in some cases not predictions at all; he shows how these can play out and have an impact on a legal practice area. They should not be ignored. I would not be at all surprised if many of his other predictions are soon borne out more broadly in our industry. What’s on Your KM Wish List? As I wrote this blog post during the holiday season, I wondered what I would include on my KM wish list. Thinking along the lines of a “Santa” wish list, I imagined having no technology, time, money, resource, attorney-bias or other constraints that might otherwise limit me. Ignoring these constraints can help generate creative and innovative KM ideas that might then be implemented to support your law firm’s or in-house legal department’s KM initiatives. A long-standing item on many KM practitioners’ wish lists – including my own – is attorneys who embrace enterprise social networking and collaboration tools as their primary means of communication and working together instead of email. Oz Benamram’s article, “Why most law firms’ internal collaboration systems are doomed to fail,” provides a good analysis of potential barriers preventing attorneys from adopting these tools. However, I believe many law firms and legal departments will succeed in moving attorneys to adopt enterprise social networking and collaboration systems (“ESNC”) for the following reasons. Attorneys know the importance of mastering email overload. Every email represents a request for an attorney’s time, attention and response. The sheer volume of email can be overwhelming and takes valuable attorney time away from responding to client-related emails. Shifting internal communications to an ESNC would enable attorneys to better focus on client-related email and result in greater customer service to their clients. Information previously captured in email could be accessible on an ESNC as part of the relevant matter, practice, or other administrative site. Pop-up notifications could be sent instead of email, and a mobile app should be offered for easy access from smart phones and tablets. Attorneys are already in the habit of asking for information at work. While an attorney may be reluctant to post a model form on an ESNC, firm culture supports sending out “Pardon the Intrusion” emails asking for information about precedents, expertise and other information needed to do their work. These emails are often sent firm-wide further cluttering inboxes for those not the object of the email. Also, the responses are forever lost in the requestor’s mailbox. Using an ESNC allows attorneys to more appropriately target their requests by expertise and opt-into communications they want to receive, while allowing others to see the thread of all responses organized in one place. Attorneys are already in the habit of using social networks at home. Attorneys are comfortable crowd-sourcing information from their social networks (g. Facebook, Google+) for advice on things like, for instance, restaurants and doctors. Having early ESNC adopters who are partners and associates will encourage others that ESNC is accepted at work. Creating communities of interest (like pro bono practice) that encourage collaboration can also foster use. Legal Technology has matured. Legal technology has developed robust collaboration platforms to mirror social media platforms like LinkedIn to replace email and discussion forums using older technologies. These new platforms include detailed profiles that allow attorneys to connect with each other by providing key biographical, practice, location, and other information. The technology also better supports checking access rights to information stored on ESNC based on criteria, such as user, role, group, or ethical and confidential screens. KM Practitioners can act as champions for successful adoption. At this year’s ARK KM conference in New York City, Amy Fox shared her insight on how she successfully secured adoption of ESNC by Intel’s in-house legal department. The key takeaway from her presentation is that a KM practitioner who acts as an ESNC champion can successfully lead adoption by personally talking to attorneys about the benefits and encouraging use. The KM wish of ESNC adoption can create a powerful KM tool by leveraging the collective legal wisdom to deliver superior legal services. Law firms and legal departments should consider adopting the same approach and add to their KM wish list. By continuing to experiment and innovate with new KM ideas, they will guarantee their competitive edge and longevity. I found this process quite liberating and encourage you to do this exercise as a way to jump start your KM ideas in this new year. Once you have your KM wish list, brainstorm how to make these KM wishes become reality. What is on your KM wish list and how would you implement it? Please share your thoughts in the comments below. We probably all have a list of projects we would love to tackle, but we are not sure if we will get the chance or see a fitting opportunity. Social Networking for the Enterprise, in the style of a Facebook or Twitter, falls into that category for us. Though we are bullish on social networking generally, we both see challenges with a full-blown solution and its fit within today’s large law firm. Most of our hesitation stems from concerns such as those Oz Benamram described in his article, “Why most law firms’ internal collaboration systems are doomed to fail.” Specifically, without the “semi-automated” solution seeding the medium from enterprise content, we see the road as awfully bumpy and fairly steep. Our SeyfarthLean program was (and is) bustling. We needed a way to get timely news out to a moderate-sized (but growing) population of folk that were neck-deep in Lean waters. Developments were happening so fast that any real editorial process would have discouraged participation or crumbled under its own weight. Further, the people most interested in contributing were the most busy – often in airports or otherwise out of the office for a significant portion of their week. When we heard “timely,” “raw” and hints of “mobile,” we both thought microblogging. But, we had some constraints. The need was acute and a solution would have to come fairly quickly. The budget and stomach for a full solution wasn’t there – and we wouldn’t have advocated for it, if it were. In response, we created our own “easy” microblog called “LeanStreams.” We talked the concept through with our SeyfarthLean Steering Committee, and some scoffed (a few rather loudly), worried that it wasn’t the right approach. But, after some healthy discussion, the group acquiesced. LeanStreams merges native SharePoint features with somewhat straight-forward development efforts. Here’s how it works. A custom webpart on the homepage of our intranet is visible only to certain, selected people. If the user “subscribed,” the webpart would expand and each post, or “LeanStream,” could be seen. The post shows up almost in real time, as it’s updated every two minutes. From the webpart, users can page through all past posts or unsubscribe from the digest, if desired. Custom webpart living on our intranet homepage. 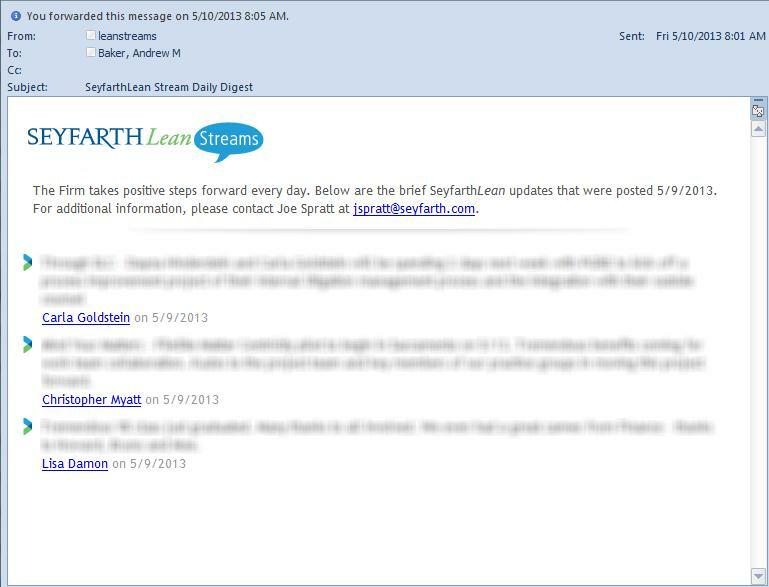 New posts enter the “stream” from a link on the webpart or via an email to the specified address. Only the text in the subject line of the email is used as the post. Anything in the body of the email is ignored. By default, Outlook and Blackberry devices limit the text to 255 characters. An iPhone will let you type more, but we have warned everyone that only 255 characters count toward the post. It’s more than Twitter, but not enough for a novella; probably right for an attorney’s “raw” post. Email generated after clicking ‘add entry’ on our webpart. Each night, LeanStreams creates and sends a stylized digest of posts. Under each post is a “mailto” link to the author of the post’s email address. That way, folk can reply on a topic fairly easily (which happens regularly). Digest email sent out at the specified interval. LeanStreams has been running for almost a year. We now have over 500 people subscribing, and new posts are submitted daily – with hundreds having already been sent. The tool has been promoted primarily through our Yellow Belt trainings. As we have trained attorneys from across the Firm, LeanStreams has been positioned as a “keep the dialog going” idea at the end. Best of all, the posts are great. People almost always read their daily digest, and it has caused a lot of cross-practice dialog from follow-ups. It’s now a mix of Lean happenings, Lean wins, client sentiments and ideas for innovation. We see the simplicity of the tool as a large part of its success. A significant portion of LeanSteams users are not frequent Twitter or Facebook users. Profiles, hashtags and the like are great when you have a lot of content. It’s a bit different game here – in terms of content shared and user persona. With that said, when first describing the application, we usually talk in terms of “microblogging” rather than “social.” Though our users may not send large batches of content into the Twitterspehere, they find the “microblogging” term more descriptive than the blanket “social” moniker. Nevertheless, we readily acknowledge that the solution isn’t perfect. We have heard people want threaded replies, profiles and the like. But, in a pinch and on a shoestring, it definitely met the challenge and has already paid dividends to the Firm. Will we move on to a bigger solution? Probably. But, not until our activity stream is feeding posts. That’s underway, actually, but a few steps out. 1. Enabled incoming email settings in SharePoint Central Administration. 2. Created a SharePoint announcements list and set the incoming email settings to have the specified list email address. 3. Created a contact object in Exchange and set the SMTP address of the contact to be the list email address of the newly created announcements list. 4. Created a custom webpart to display the items from the announcements list that are created by incoming emails. 5. Designed a custom webpart to refresh every two minues using jQuery. 6. Designed a custom webpart that allows users to subscribe to daily or weekly emails by storing the their preferences in SQL. 7. Created a console application that will send an email digest of items created in the announcements list. A scheduled task will run this console application every morning and will send a daily or weekly email based upon the user’s preference stored in SQL. 8. Created a list Event Listener to check for auto-reply emails and delete them. Social networking within the firewall, as an improvement on email and as a method for improving efficiency, effectiveness, and engagement, is increasingly in the news and in the blogosphere, as demonstrated by two recent posts in the Three Geeks (How One Company Banned Internal Email and How and Why LAC Group Successfully Eliminated Internal Email), Mary Abraham’s It’s Time To Get Serious About Social, and the E2 Conference most recently held in Boston that I blogged about on Caselines here and here. I’ll be presenting on building a business case for an enterprise social network as part of the second panel on the ILTA KM Peer Group’s six-session track at ILTA’s annual conference (“conference”), this year to be held in Washington DC. It’s just a few short weeks away, and will last from August 26th to 30th. Specifically, the second session of the track will feature three stories about enterprise social networks in legal organizations. As mentioned I will be discussing early-stage work on developing a business case at a large law firm; Ann Hemming will be addressing her UK law firm’s use of enterprise social network platform Yammer for idea generation, marketing coordination, and more; and Col. Scott Reid, Chief Knowledge Officer of the U.S. Army Judge Advocate General’s Corps, will be telling the story of the Army JAG’s milnet and its successes in increasing knowledge sharing and transfer. What’s the business case for Facebook in the office and Twitter inside the firewall? Some organizations have already demonstrated the benefits of sharing knowledge through in-house social networking. Others are beginning to experiment with it. Hear how legal organizations can add value to their traditional KM offerings with internal social networking as a panel draws from their experiences with implementing various social networking programs. They will explain their strategies, implementations and user adoption challenges. Mary Panetta will moderate this session, which she and Andrew Baker developed. The session hashtag is #kmpg2; written tips for evaluating enterprise social networks will be provided; and it will be 1 PM on August 27th in National Harbor 2. We look forward to seeing you there! KM often leads a firm’s initiative to promote the internal use of social media tools by attorneys—a natural fit given KM objectives to facilitate knowledge sharing, collaborate on matters, and identify subject matter expertise. However, when it comes to using social media to reach external audiences—clients, colleagues and thought leaders—KM can find itself sidelined, brought in late in the process, if at all, to develop a policy for regulating attorney behavior on social media platforms. This is a lost opportunity, and can hinder a successful outcome. Being involved at the outset allows KM to influence the overall process, one firmly grounded in principles of collaboration, user adoption and technical compatibility. Below are suggestions for ways in which KM can bring value to an external social media initiative. An external social media initiative will likely involve various facets of firm management. Broadly stated, marketing will bring expertise in branding, reputation building and business development; IT will address security, capacity and burden on systems; firm general counsel will concentrate on risk management, ethical considerations and improper communications; firm Sales & Marketing Executives (SMEs) will outline practice group needs, client perceptions and relationship building; KM will promote best practices in knowledge sharing and leveraging content for target audiences. Each department will have its own priorities, and the social media team will be challenged to reconcile departmental agendas with a shared vision for the initiative. 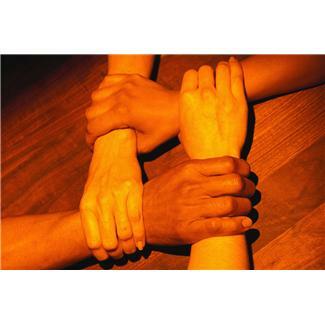 No stranger to collaboration, KM can help keep the project on track by insisting on a team-defined mission statement. In addition to stating the overarching goal (e.g., leverage social media to increase client awareness of expertise in a specific practice area), an effective statement will spell out narrower objectives that advance the strategy, such as producing related legal content; include a timeline for reaching milestones; and identify factors for measuring success. KM experience in project management and collaboration can provide the group with a process and framework to overcome differences and ultimately deliver results. Is there a lack of attorney knowledge about how external facing social media platforms work and what they are best suited for? How does attorney experience with internal social collaborative tools like blogs, wikis, and enterprise social networks prepare them for external-facing social media activity? What are the perceived risks in stating opinions, responding to posted comments or criticisms, or appearing too casual? Will sharing knowledge provide competitors with an advantage, allowing them to better compete? Is there misunderstanding about the nature of professional versus personal communications on external social media platforms? Will sharing intellectual capital negatively impact business opportunities and actually reduce the likelihood of procuring billable work (i.e., why are we “giving it away?”)? Does making contacts through public social media platforms undermine the firm’s compensation model, where clients are already “taken”? Is time spent on social media platforms a good investment, or will it result in lost productivity (the “waste of time” argument)? Tackling these issues in advance will help the team formulate an approach to training, as well as the optimal way to roll out the initiative. It may be necessary to create specific guidelines for each platform in order to assuage attorney anxiety. For example, a set of LinkedIn guidelines can address standards for accepting, declining or requesting connections; whether there are prohibitions on soliciting or providing recommendations; what is the appropriate scope of communications; and how to use descriptive words in position titles, summaries and areas of expertise. Making sure that firm attorneys—from summer associates to semi-retired partners— understand the parameters of professional conduct in a social online setting is a key component in an external social media strategy. KM can shed light on the strengths and weaknesses of each platform, and which is best aligned with the firm’s strategy. Bearing in mind that an external social media strategy may be executed in stages, each platform should be viewed in its context as a short, medium or long term solution. There are, of course, other ways KM can contribute to developing an external social media strategy. The key is to get involved at the beginning, and help shape the process from the outset. Then, when it comes time to draft a firm social media policy, KM will be in a strong position to support and advance the strategy rather than get in the way–or worse, be left behind. One of my favorite aspects of the annual ILTA conference is the willingness of peers to share information with each other. The learning imparted in the many educational sessions is truly amazing, and while people are in general perhaps more restrained in this era of bloggers and instant dissemination of key points via Twitter, I have heard presenters remarking on several occasions that they have shared more than they perhaps intended in advance. Thinking about why that is so made me realize that ILTA leadership and the collective efforts of its dedicated members have figured out a number of ways to make ILTA conference attendees social. In other words, conference is a community where social connections, collaboration, and knowledge-sharing among members is valued and encouraged. Without being too Kumbaya about it, legal enterprises, which at their core sell knowledge and advice, could benefit from comparable sharing and trust inside the enterprise, between lawyers. Greater willingness to share experience, and perhaps even participate in knowledge-generating activities, could greatly enhance many a legal KM program. So how does ILTA do it? I don’t think there’s any one thing ILTA does that does not occur in other places, but I’ve identified here a few distinct approaches that have an impact. Dale Carnegie‘s advice on making friends and influencing people include the point that “a person’s name is, to that person, the sweetest and most important sound in any language.” A name badge is an easy and obvious method of enabling people to get to know and say each others’ names. Saying someone’s name makes them feel significant and valued, albeit in a small way. At ILTA badges have at least seven functions. 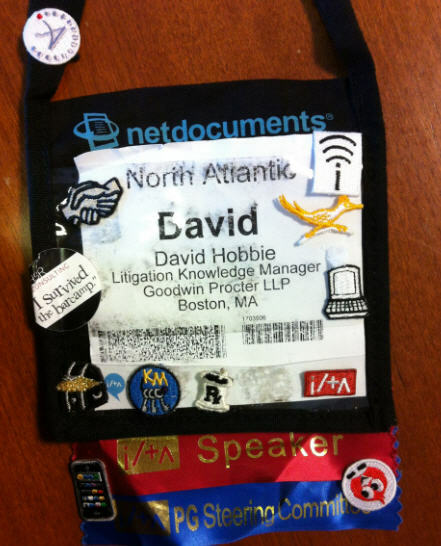 The picture above is, obviously, my somewhat abused ILTA badge from the 2011 conference. It has my name. It has room for “bling” (the next social approach); ribbons are typically attached at the bottom of the badge; and it lists my title, employer, and location, allowing for affiliations and connections to be uncovered (and for e-discovery vendors to mistakenly believe that I can help them somehow). Functionally, it allows conference workers to make sure that you are appropriately accessing the sessions and services to which you are entitled, and by virtue of the database-linked bar code it also serves in the vendor hall as the modern replacement for dropping a business card in a glass bowl. Finally, it’s where you store meal and, yes, drink tickets. 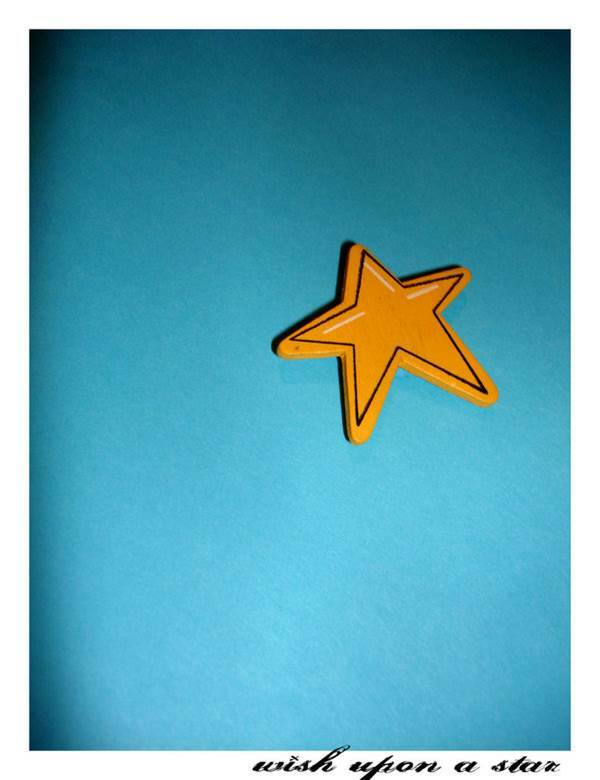 What can we do to use the concept of badges in knowledge work? Today’s online knowledge and information systems have badges in the form of intranet people profiles. In more advanced collaboration systems, such as wikis, blogs, and internal social networks, every piece of activity is tagged to the person, usually with a hyperlink to some kind of profile where you can learn more about the person. In any knowledge-based information system, being able to “pivot” on a person and uncover both contact information and more about what that person has done is absolutely critical. “Bling” is the little circles and other pieces of cloth backed by sticky material stuck on a badge or the badge’s straps (though my daughter charmingly has absconded with a KM badge and has it on one of her dresses). Bling indicates interest and affiliation with subject areas like knowledge management (the keys), social media (a little twittery bird), information management, and so forth. When I was in the ILTones chorus, we had a little piano bling too. Bling in theory shows interests and skills. In practice, however, it is also really fun to share and trade, and provide an opportunity for people in leadership roles to do a little something for people they meet. Doing even apparently trivial favors for someone is a great way to build trust and enhance knowledge-sharing. What favors can you do? How can you have your lawyers build trust with each other? And, what bling is on your profile? How do lawyers share their interests and expertise in your organization? The ribbons attached to the bottom of a badge typically identify something about person’s relationship with ILTA. They are color-coded, and let you tell at a glance whether someone is a first-time attendee, a speaker, a peer group leader, or conference chair. To some degree, ribbons are a status indication, but they also provide an opportunity to start a conversation (“How are you finding your first conference, newbie?”). Ribbons are also a way for ILTA to provide recognition for various kinds of volunteer activities. How do you recognize participation in your organization’s knowledge-sharing efforts and culture? ILTA is a peer-driven organization. It wouldn’t survive if it didn’t do a good job recognizing and showing appreciation for its members, who do much of the work that actually leads to conference. Part of the appreciation is expressed through consistent messaging at formal events such as conference opening and closing sessions. I’ve noticed that ILTA Executive Director Randi Mayes always singles out the ILTA members who support the JAG Corps and the courts, as they serve the public good as well as benefiting conference. More recently, ILTA has established a formal recognition program, the Distinguished Peer Awards, which culminates in a black-tie dinner and Oscar-style awards presentation (admittedly, without a live orchestra, awkward thank-you speeches, or closeup shots of tearful runners-up). I was honored to be on a short list for the KM Distinguished Peer Award this past year, and was thrilled at the opportunity to be recognized for my work, as I know all the nominees and award-winners were. Appreciation is especially important for people working in the legal industry. Lawyers by nature are not well-versed in working with others (see What Makes Lawyers So Challenging? ), and as less sociable perfectionists are not always best at expressing appreciation or providing effective feedback. Providing consistent, formal appreciation and recognition for our KM workers and champions can keep the KM team strong. ILTA enables connection through surfacing affiliations any number of ways at conference. There are regional meetings, receptions by peer group, CIO meetups, meetings for social media fans, different arrangements at meals, ways for new attendees to meet, etc. etc. Each different slice brings you in contact with a different set of peers and new opportunities for connection. This rich approach to sets of groups contrasts with the relatively simple formal structures seen in law firms. An attorney will typically major in one practice area and have a minor in another, but type of work is only one (albeit admittedly very important one) of the potential affiliation slices. What other affiliations can you leverage or encourage at your organization? “Although technology surely has its place, working with knowledge is primarily a human activity needing human organization and understanding. People will share more where there are rich and varied opportunities to uncover and connect over shared interests and affiliations, do each other favors, and recognize and reward team member contributions. Extensive peer connection and structures that support communities also provide a vital support for our challenging knowledge work and for optimally functioning organizations. As announced in some detail on the main ILTA blog. the conference schedule and detailed session agenda are available. There is also a session overview that lets you compare what’s happening at the same time (so you can agonize over which of two excellent sessions with great speakers you should choose.) The main conference site also has such goodies as an #ilta11 twitter stream, information about the venue, and so forth. I would be remiss if I did not mention the excellent mobile app, available for iPhone, iPad, and whatnot (yes I have an Apple bias when it comes to mobile technology). The theme this year is “Rev-Elation,” which, leaving aside the odd spelling, definitely invokes the high energy and insight that I’ve come to associate with conference. Conference has both a “formal” KM track (which means those 6 sessions managed by the ILTA KM PG) and many other sessions that may be of interest to knowledge management professionals or that even cover topics in what I consider “core” KM, such as enterprise search. This post will briefly describe and map out the six sessions on the formal KM track, in chronological order as they appear at conference (two on Monday August 22 and four on Wednesday August 24). You may want to “follow” the hashtag comprised of the session “codes”, e.g., #kmpg1. This session will address new technologies and advances in this area, which in the past has been reserved for niche legal practice areas such as trusts and estates. They’ll cover strengths and weaknesses of different vendors and approaches. Speakers include Peter Krakaur of Orrick, Ayelette Robinson of Littler Mendelssohn, Michael Tominna of DLA Piper, and Yvonne Willis of Pilsbury, Winthrop, Shaw & Pittman LLP. Speakers are Beau Mersereau, Director of Applications, Development, and Support at Fish & Richardson, Katrina Dittmer, Practice Support Manager at Baker Daniels, and me, David Hobbie, Litigation Knowledge Manager at Goodwin Procter LLP. Amen. Heads up for attendees–this session will focus largely on internal application of social media tools, not on the (potentially significant) marketing aspects of external-facing law firm social media activity. Tom Baldwin, Toby Brown, Pamela Woldow headline the outstanding panel. Howard Nichols of Squire, Sanders & Dempsey; Scott Rechtschaffen of Littler Mendelson, P.C., and Brynn Wiswall, Baker Donelson. "A sound KM strategy is essential to success. Whether you are just starting a KM program or you've been at it for years, you'll take away insight into how your colleagues have formulated or refreshed their KM strategies to optimal levels, and what did and didn't work." Legal KM guru Sally Gonzalez of HBR Consulting joins Steven Lastres of Debevoise & Plimpton and ILTA KM blog contributor John Gillies of Cassels Brock in this panel moderated by Patrick DiDominico. 6. KMPG6, "KM Helps Meet the ACC Value Challenge," Wednesday at 3:30 PM, "Delta C"
"The Association for Corporate Counsel (ACC) has challenged law firms to better understand their clients’ business, be more efficient in their work, be more effective in training junior lawyers, and better budget and manage costs. Find out how knowledge management can help achieve these goals." I'm moderating this session, the last of the track, which I previously posted about. Panelists include  Mary Panetta of Crowell & Moring, Jeffrey Brandt of Clearspire, and Thomas Wisinski of Haynes Boone. I look forward to seeing many ILTAns there!